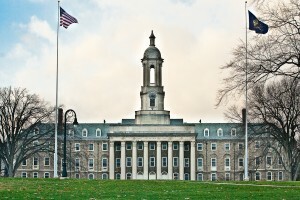 In a sign that public support for Penn State remains strong, the number of donors that gave money to Pennsylvania’s flagship university increased modestly last year, officials reported yesterday. Fundraisers managed to reel in 8,000 more contributors during the 2012 fiscal year, netting $208 million for the quasi-public university from 191,000 donors. It was the second-best fundraising year on record, officials said. The total amount raised fell by 24 percent, a decline caused by a record $80 million contribution in 2011 for a new ice hockey arena on the University Park Campus. Excluding that windfall, total contributions would have risen. The strong financial backing is good new for the Penn State family, which is still reeling from the Sandusky scandal that has rocked Penn State since November. Even with continuing anger toward university officials and trustees, alumni are raising their support for their alma matter and becoming engaged more than ever before.